Businesses rely on procurement teams to uncover savings and efficiencies in supply sourcing across departments. However, identifying the products or suppliers that offer your company the best value isn’t always top of mind for employees placing orders. With new curation features of Amazon Business such as built-in custom messaging and product flagging, you can keep your purchasing programs on track. Curation enables you to tag items as “preferred” and incorporate internal messages directly in the Amazon Business user experience and track and report on purchases of items that may not meet your procurement policies. You can make the best choices while still giving your users the freedom to purchase what they need. This builds visibility for you and trust across your teams that they are abiding by your company’s best practices. Curation is now available in every Amazon Business administrator’s account. Click here for step-by-step instructions on how to use curation features. 1. Tag items as preferred with the click of a button. Items can be marked preferred for all users of the Amazon Business account or just for specific groups. Preferred items appear first in search results, and preferred item messaging is shown on product detail pages as well as in the Shopping Cart. 2. Mark categories that may not meet your company’s purchasing policies. You can flag product categories that are prohibited for purchase at work, that do not meet company standards or that need to be purchased through a different process. For example, if you want users to perform laptop purchases through your IT department, you could message to users that the laptop computers category may not meet your corporate purchasing standards. 3. To enhance awareness, you can customize messaging shown to a user attempting to order an item in a product category your administrator has designated as one that does not meet your company’s procurement policies. In the example above, you might add a message about the company’s laptop purchasing process. Instead of simply blocking a purchase, Amazon Business curation helps the user understand how to get what they need while following your company’s policies. 4. For even greater visibility and control, set up approval workflows based on whether you have flagged certain categories as those that don’t meet your procurement policies. With this feature enabled, whenever a user wants to purchase an item in these categories, an email is sent to the designated approver, who can decide whether the purchase should be allowed. This creates a line of communication between buyers and approvers, so the business learns more about which items are frequently required and how it might want to modify its policies. You can also run Amazon Business Analytics reports about purchases in these categories to gain deeper insights. This visibility helps you consolidate purchases, leading to simplified buying and greater purchasing power. Once you implement curation, you can use Amazon Business to measure your improvements. For example, you can track your reduction in purchase levels of products that do not meet your procurement policies before and after you create custom messaging. You can also track the consolidation of pricing and orders as you’re able to bundle similar requests towards one preferred supplier or item SKU. Log into your Amazon Business account to start using the new catalog curation tool. 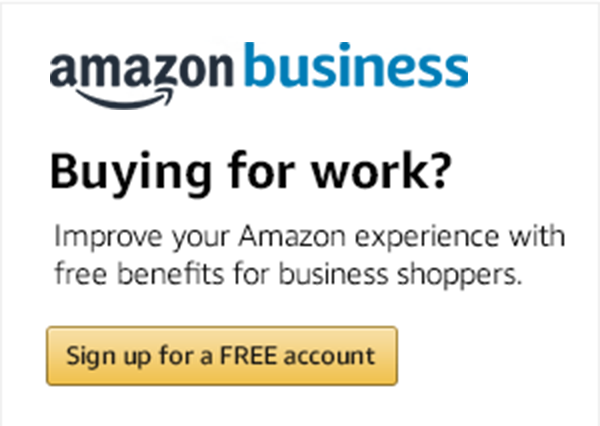 Or, create a free account to access all the benefits of Amazon Business.